Thanks to modern technologies, we are more "connected" than ever before in the history of humanity, but a pediatrician and a psychologist question the wisdom of responding instantly to every bleep, ping, and vibration from a portable electronic device. They fear the people we should be connecting with the most — our children — may pay the ultimate price of tech-savvy parents. 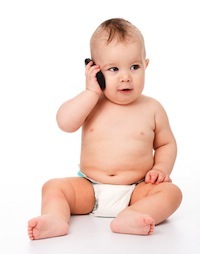 Dr. Radesky specializes in child development. Her concerns about how parents are disconnecting with their children in order to stay connected to their digital devices started in Seattle, where she witnessed parents deeply engrossed with whatever popped up on their mobile devices while their children tried in vain to get their attention. She saw this happening even when the children were infants. After moving to Boston, she and two fellow researchers conducted an informal observational study of parents and their young children in fast food restaurants. Over the course of the summer, they documented 55 family groups. In many cases, parents rarely bothered putting their mobile devices down to eat, much less interact with their children. That's a big mistake, according to Radesky. She says kids learn best with face-to-face interaction. It's how they learn language, conversation, and how to read facial expressions. It's also how they learn about emotions and how to handle them effectively. Radesky was not surprised to witness children of the most disconnected parents acting out the most passionately. They were begging for their parents' attention the only way the knew how even though it often provoked angry parental responses. Angry parental responses make sense to Steiner-Adair who says the mental mechanics of responding to emails, phone calls, texts, and other electronic forms of communication activate a part of the brain she calls the "to do" part. There's a sense of urgency generated by these activities that signal an emotional sense of time pressure. Interruptions are often met with irritability. In her book, The Big Disconnect: Protecting Childhood and Family Relationships in the Digital Age, she writes that parents who can't put the phone down send the message to their children that the children don't matter. Her research identifies children who feel their parents consider the phones and other mobile devices as more important than the kids. When Steiner-Adair asked 1,000 children aged 4 through 18 about their parents' mobile devices, the overall theme of their responses was "sad, mad, angry and lonely." Some of them expressed joy when throwing a parents phone in the toilet, the oven, or hiding it elsewhere. There hasn't been enough time yet to gauge the long-term consequences of disconnecting with our children so we can stay connected to cyberspace. Even so, a growing body of knowledge is suggesting it might be good for the family to think twice about to whom and with what we choose to stay connected. Neighmond, Patti. "For The Children's Sake, Put Down That Smartphone." Shots. NPR. Apr 21, 2014. Web. Apr 28, 2014. Radesky, Jenny S, et al. "Patterns of Mobile Device Use by Caregivers and Children During Meals in Fast Food Restaurants (pdf)." Pediatrics. American Academy of Pediatrics. Mar 10, 2014. Web. Apr 28, 2014.